With land values skyrocketing and cattle prices falling, ranchers across the American West are seeking to capitalize on a lifetime of stewardship. The solution for many comes in the form of a conservation easement -- a voluntary legal agreement that permanently protects the conservation values of a property by limiting or restricting future development. Saving the Ranch is a concise and readable guide to conservation easements for ranchers, conservationists, and developers concerned with protecting the natural and scenic values of ranch lands in the western United States. The book shows how ranchers can reduce estate taxes, generate and shelter income, and combine land conservation with estate planning. Case studies explore how conservation easements have been used, helping readers to understand the variety of circumstances under which easements can be effective. Throughout the book, photographs, maps, and illustrations bring to life the examples presented and the situations described. Saving the Ranch gives ranchers the information they need to continue their stewardship of natural resources while identifying and capturing the conservation value of their land. 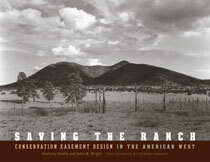 It is an essential new work for anyone concerned with protecting the integrity of ranch lands and helping ranching survive as a way of life in the American West. "A how-to book of the highest order for land owners and conservationists. It tells all who care about the American West how to use land trusts and conservation easements to protect private lands and the wildlife that depend on them." "The American West epitomized an ideal American landscape, characterized by vast expanses picture is changing rapidly. Increasingly ranches that have been in families for generations are development. Ranch lands also comprise some of the most important wildlife habitat and ecological the West. This book provides real options for private landowners that both maintain the viability operations and protect open space and wildlife habitat. Every rancher, and everyone concerned and the wildlife habitat they contain should read this book."